Is 25% enough for you? 25%, that’s the answer from Premier Kathleen Wynne and the Ontario Liberals. Mired with a personal approval rating of 11% (as of 01/03/2017) the Premier announced a further reduction in the electricity bills of 17% this summer (after an 8% reduction that was set January 1st) as way to avoid the knives that would cut her and the Liberals out of government in the on 2018 Ontario General election. In the announcement, Wynne also stated that following the summer reduction in rates, increases will be tied to the annual rate of inflation. Rates are currently frozen between November 1 2016 and May 1 2017 and tradition shows that previously approved rates go up on May 1st. So a question: with a reduction coming in the summer, will the 17% rate reduction have to take in any increase that may come on the first of May? With this “olive branch” from the government, there are so many questions and so few answers. I recently attended a meeting about Hydro costs hosted by Nepean-Carleton PC MPP Lisa Macleod; it featured a presentation by Peter Gallant from Wind Concerns Ontario. Mr. Gallant went behind the line items and presented what was represented on each line. There is so much more behind your electricity bill than just a box that says please pay this amount. It will come as no surprise that your monthly bill is political. Political in such that choices are made in how the bill is written to make it seem that you should feel good about the fees you pay, right down to the final line of your statement indicating how much you saved on electricity because of reductions and time of use savings (I hope that makes you feel better). Then there are the acronyms! My goodness, the number of acronyms that are used is mind-blowing. LDC, NUG, OPG, RPP, TOU, FIT and MicroFIT, GA, the list goes on. My take away from the session was that producing hydro is burdened with levels of debt payment and delivery fees. But also that green energy, the McGuinty Green Energy Program, is going to burden Ontario Taxpayers for years as FIT (Feed in Tariff) contracts guarantee fees paid to generators that are up to 6 times more than what we currently pay for its use. The difference, and the bulk of what we pay, lies in the delivery and renewal generation connection charges created to bring in the revenue that time of use electricity rates cannot for the creation of wind and solar energy in Ontario. The announcement by Wynne and Energy Minister Thibeault is going to push paying for contracts, repairs and expensive energy generation through to the next two generations or more. By only allowing rate of inflation increases for the next four years, debt payments of billions are being delayed, increasing the provincial debt further and increasing debt financing payments closer to the top the expense sheet of the province. Prior to the announcement from the government, the NDP pledged to cut electricity rates by 30%. No word on how to do it, but just to cut rates by a third. So now of course, Ontarians want to know how the Brown led PC’s will challenge the Liberals ‘reduce and almost freeze’ plan. MPP Macleod told those at her meeting that there will be a response, but it will be thought out (unlike the NDP plan?) and a workable plan to provide affordable electricity for Ontario. We’ll have to wait, but I hope that the plan will include a dash reality, acknowledging what path Ontario has been led down by the McGuinty-Wynne Green Energy Coalition. This entry was posted in Ontario, Ontario Hydro, Ontario Politics, Queens park and tagged Green Energy Program, Ontario Wind Concerns on March 3, 2017 by redheartbluesign. DISCLAIMER: I am not a climate change denier, I have been on the earth long enough to know that our climate is changing and that everyone must do something so that when Canada celebrates 250 years our great great grandchildren will have a just as great country as we did 100 years previous. But, I am also aware that wages are not increasing in the private sector as fast as taxes are going up and being introduced. The end of being able to fund EVERYTHING the government wants/needs to do is coming. Somehow I got an email from a company that was announcing its purchase of Cap and Trade credit, I do not know how they had my email address but that is beside the point here. An Ottawa area real estate team annouced that they had figured our their carbon footprint and purchased carbon credits to offset the carbon they create/use each year. My first reaction was great – thank you for recognizing your environmental impact. My second was, you have a new cost and now you are going to pass it on your clients? On top of that in the email, there were suggestions on how to reduce our individual carbon footprint like using LED bulbs, lowering our thermostats when we’re not home, using cloth or reusable grocery bags an fill our green, black and blue bins for recycling. Did the writer of this email think that we weren’t already doing those things? People are doubling up sweaters when they are home to reduce electricity consumption to stay warm. Many have to decide do I heat or do I eat? I asked the company to talk to the government and let them know that consumers are reaching the end, the disposable incomes of Canadians are thinning out because of the passed on costs of taxes and carbon credits to consumers. They Real Estate company probably don’t expect any replies, but I decided I should ask a few questions on their decision to purchase Carbon Credits. How many did they buy? How much did they pay? Will they be passing the cost of their purchase onto their clients? Are they aware that by passing on the cost, they are adding to the cost of homes in Ontario making it more difficult for first time buyers and families that need a new home to replace the once they have grown out of? So, kudos to them, I applaud their stance that believing that they alone were responsible for their carbon footprint and that they alone should pay for it. Kudos to the Adam Mills Real Estate Team in Ottawa for taking a stand for consumers. They won’t get much press for doing what they did, but I hope that word sneaks out and that they have set the bar high for others to follow. That the government will be adding a Carbon Tax line to our hydro costs is expected – that one company in Ottawa has decided NOT to is unexpected. I hope others WILL take note and follow their lead. I am not in the market for a new home, but if I were they would be getting a call from me. Thank you for reading this post; to catch all my posts and be notified as new ones come up please follow me on WordPress. You can also see me on www.redheartbluelife.wordpress.com for what I see, hear and read. This entry was posted in Ontario, Ontario Hydro, Ontario Politics, Ottawa, Queens park and tagged Cap and Trade, Carbon Tax, Ottawa Real Estate on February 6, 2017 by redheartbluesign. What’s next for Ontario? What’s next for the Wynne government? Following the release of the Ontario Auditor General’s 2015 Annual Report, the question of what is next for Ontario is a valid one. Bonnie Lysyck, the AG, brought other questions to the surface; Can Premier Wynne and the Liberals be trusted to change the way they govern? Do they want to? Can Ontario ever recover from the bad decisions Dalton McGuinty and Kathleen Wynne have made about our energy and the price we pay for electricity? The AG’s Report identified that Ontarians paid $37 billion more that we should have because of decisions made by both the McGuinty and Wynne governments. They ignored the expert opinions and made political decisions. We are expected to pay Billions more in the next few years while producing too much energy for our needs. Increased funding in the Community Care Access Centres has NOT resulted in better service for those in need of care in their homes. Wait times are as long as they were before the funding increase. While the AG did not investigate funding for hospitals, 4 years of 0% funding increases to Ontario hospitals are putting additional strains on our healthcare. The government says it is investing in business; but the AG states that there is no attempt to measure if the investments are actually delivering the jobs that were meant as part of the investment agreement. There were also concerns from Ms. Lysyck that the $1.4B invested was for the most part going to large corporations and companies she described as having ties to the Ontario Liberals. The government will have spent over half a BILLION dollars on the implementation of two computer systems that are meant to help the young and vulnerable of Ontario by 2020, when these were meant to be in place years before that. The Social Assistance Management Systems (SAMS) and Child Protection Information Network (CPIN) both have had delays; with SAMS taking the cake as Project Managers released SAMS in a ‘big bang launch’ knowing that it was not ready and had thousands of defects. In the private sector, heads would roll for such decisions. The flaws in SAMS caused overpayments, underpayments and overpayments that were not actual overpayments but reported as such, to families, youth and adults receiving these benefits. CPIN came out of the Jeffery Baldwin Inquiry in 2012; to date 5 of 47 Children’s Aid Societies have rolled out CPIN. While the government will spend millions more into it (for a total of $250 million), the individual agencies are also spending millions more than budgeted, out of their operating budgets, taking the system live – money that should be going to child protection services and programs. The 2015 Auditor General’s Annual report has raised several questions about the performance of Kathleen Wynne and her government. The timing of her report is interesting as it follows the publishing of Dalton McGuinty’s new book “Making a Difference”. Both publications present a case for “making a difference”, whether it’s a good or bad is up for debate. The government only has to withstand four more days of Question Period in Queen’s Park before the house rises for the winter break, can it survive intact without any casualties? I invite you to share your ideas by commenting to this post or any post on my blog. You can also email me directly at rdmedia@bell.net. This entry was posted in Ontario, Ontario Hydro, Ontario Politics, Queens park and tagged AG Report 2015, Bonnie Lysyck on December 6, 2015 by redheartbluesign. This weekend I attended and spoke at rally decrying the state of Ontario Hydro One, rates, charges and the impending sale of 60% of the public utility to private hands. At stake is not only the financial health and future of Ontario, but also for Ontarians. The sale of Hydro One means that a valuable piece of Ontario infrastructure now falls out of our hands, and never will come back – unless at a very great price. I should point out, in the effort to remain transparent, that in May 2012, the Ontario PC Party released a White Paper advocating a partial availability of Hydro to a Pension Fund led equity stake with possible door opening for future investments. But to see a large majority leave public hands is a very big deal. The two-hour rally had many impassioned speakers and stories of Hydro bills that are putting people’s lives, businesses and homes at risk. It was well covered by local media, meaning it was on the radio hourly from mid afternoon on and also made the local TV evening news. A provincial rally at Queens Park is planned for May 13th, we expect representatives from the opposition to attend and speak including the newly selected Ontario PC Party Leader. With 10,000 complaints to the Ombudsman and growing, Minister Chiarelli continues to brush the allegations away, like a speck of dust. 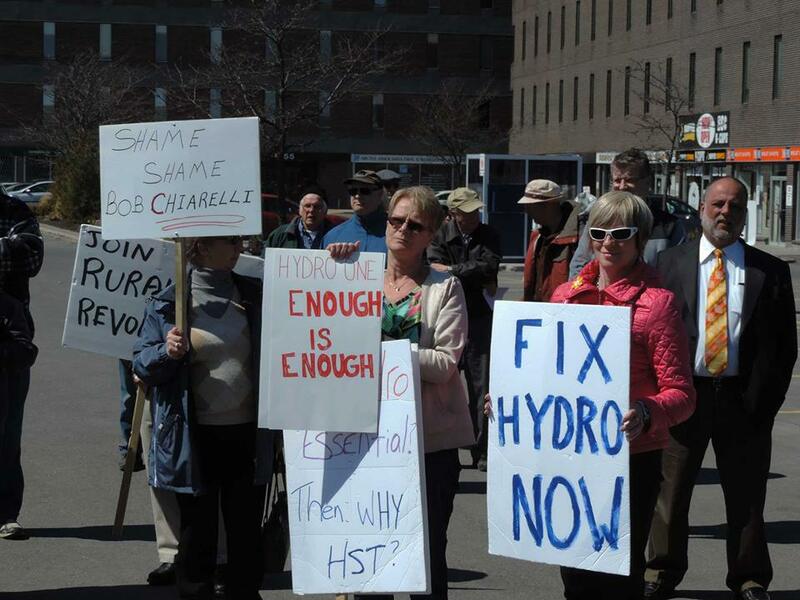 This entry was posted in Ontario, Ontario Hydro and tagged Bob Chiarelli, Gille Brisson, HydroOne, Ontario Liberals on April 19, 2015 by redheartbluesign.